The current browser does not support Web pages that contain the IFRAME element. To view the agricultures Picture Banner, you must use a browser that supports this element, such as Internet Explorer version 7 or later. 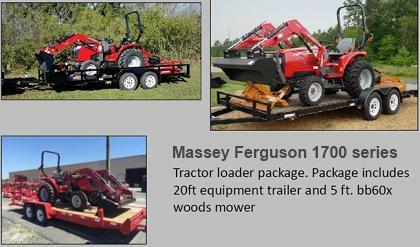 Massey Ferguson is proud to offer the 1700 series line of premium compact tractors. Designed with the performance and versatility in mind, these tractors have all the tools to get the job done on any farm or job site. Going bigger, our Massey Ferguson 2600 Series of utility tractors allows our customers to reliably and comfortably perform a wide variety of jobs. Designed for comfort, built for efficiency. Synchro-shuttle transmission makes your work faster and easier. 3-point hitch to get the most out of your implements. The 2700 E Series tractor gives you a rugged stamped steel mower deck, high-performance engine, power steering.